BANGKOK (AFP) – "Red Shirt" anti-government protesters called for UN-mediated talks on Sunday as the toll from several days of clashes with the Thai army in the capital rose to 25 dead and more than 200 wounded. A top protest leader also urged the revered king to intervene in the crisis, which has turned areas of the city into no-go zones as troops fire live ammunition at protesters, some of them armed or using slingshots and fireworks. "We call for the government to stop firing and to withdraw soldiers who are blocking the area around the protest site," said a Red leader, Kokaew Pikulthong. "We call for talks with the UN as mediator." There was no immediate response from the government, as the army put off a plan to impose a curfew in parts of the city but did not rule out restricting night-time movements if the situation deteriorates. Authorities said they would send workers from the Red Cross to help anti-government protesters -- particularly women, children and the elderly -- who want to leave the vast protest area in the heart of the capital. Sporadic gunfire continued to echo around the fringes of the Red Shirts' sprawling encampment as a swathe of the city was shrouded in black smoke after demonstrators torched piles of tyres in roads. One shop was ablaze. Two men were shot and badly wounded during a confrontation between troops and several hundred anti-government demonstrators who threw stones, Molotov cocktails and firecrackers, said an AFP reporter. 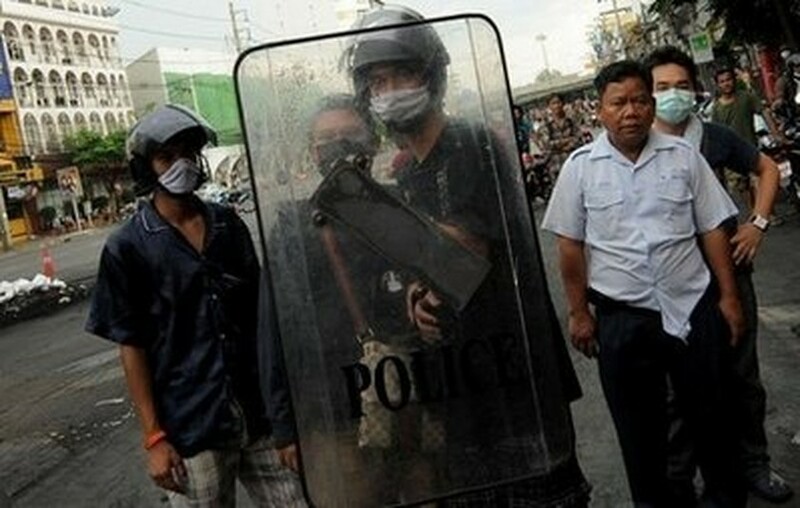 One man died Sunday as street clashes continued, emergency services said. It was not clear how he was killed. The Reds called on Thailand's king to intervene, saying he was the "only hope" for an end to the crisis, which has left more than 50 people dead and 1,600 wounded in total. The military on Saturday declared a "live fire zone" in one area where a foreign witness said he earlier saw troops fire towards a group of Red Shirts advancing with a Thai flag. Three bodies were later seen on the ground. New York-based Human Rights Watch said Thai authorities were on a "slippery slope" towards serious human rights abuses by designating live fire zones. Facing a military armed with assault rifles, the protesters have fought with homemade weapons including fireworks, rockets, slingshots, and burning tyres. Abhisit last week shelved a plan to hold early elections -- which the Red Shirts initially agreed to -- because the protesters refused to disperse.